Verna Johnson was a devoted wife, mother, grandmother, sister, aunt, cousin, and friend. She was born August 1, 1933 in Pattison, Texas to Maple Barley Sr. and Alex Hartwell. She is preceded in death by her parents, husband Herman H. Johnson Sr, brothers Arlington Barley, Maple Barley Jr., and Ralph Barley. She grew up in Pattison, Texas where she was raised by her Christian mother Alex Barley, and was taught the values of love for God and family. She attended Clemons High School in Pattison, TX. Verna accepted Christ at an early age. 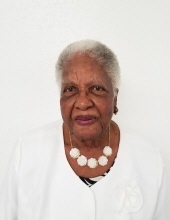 She attended Williams Chapel A.M. E. where she served faithfully as a stewardess, trustee, and secretary. She was known as the “Mother” of Williams Chapel A.M.E. Church until they closed in 2015. She then joined Curry’s Chapel A.M.E. Baptist Church in December 6, 2015 where she currently served. Verna was also a member of the Herrings of Jericho, Beautiful Light #389 in Pattison, TX where she currently served as court secretary. During her lifetime she was united in marriage to Herman Henry Johnson Sr. To this union nine children were born. Two eldest sons Hosea Johnson Sr. and Herman Johnson Jr. and seven girls: Cheryl Manuel, Carolyn Green, Kathy Foster, Sarah Lasker, Norma Franklin, Janice Perkins, and Felisa Lewis. Verna worked for the Royal Independent School District as a food service worker for over 25 years until she retired. She then continued to work as a domestic engineer where she was well loved and respected as a mother. She also was a very good cook and baker. She was known around town and neighboring cities for her FAMOUS “mouth-quenching” flavorful T-cakes. She was well-known and respected in the community and often called Momma J and AKA: T-cake lady. Verna also spent leisure time at the Fort Bend Senior MOW Senior citizen center in Brookshire, TX where she participated in daily activities that included fishing, BINGO, (BANGO) as she would say, and shopping trips. She recently attended the 2018 Yule Ball, where she had a fabulous time. Verna also traveled abroad on cruises with her girls to Cancun, Jamaica, Cozumel, and Cayman Islands just to name a few. Verna leaves to cherish her special memories her brother Joseph Barley (Rosalyn) and sister-in-law’s, Alma and Janice Barley. She also leaves her nine children: Hosea Johnson Sr.(Lori), Herman Johnson, Cheryl Manuel (Michael Sr.), Carolyn Green, Kathy Foster (Elton), Sarah Lasker (Roosevelt Jr.), Norma Franklin (Erroll), Janice Perkins (James Sr.), and Felisa Lewis. She also leaves 22 grandchildren, 27 great-grandchildren, and a host of nieces, nephews, relatives, and friends. She leaves behind her running buddy Elizabeth Rogers (AKA: Peg). Last but not least she leaves behind her four-legged companion Panko, who she nicknamed Tankle. To send flowers or a remembrance gift to the family of Verna Lee Johnson, please visit our Tribute Store. "Email Address" would like to share the life celebration of Verna Lee Johnson. Click on the "link" to go to share a favorite memory or leave a condolence message for the family.